The horse and cart model describes the relationship between mitochondrial metabolism, signal transduction, and gene expression in mammalian biology, as well as in degenerative diseases associated with aging and cancer. (A) In healthy mammalian cells, the essential redox metabolic process occurring in the mitochondria and cytosol can be considered as the horse, and its related gene expression can be considered as the cart. In normal cells, oxidative metabolism and gene expression are tightly coupled via the nonequilibrium steady-state fluxes of reactive metabolic by-products and leaking electrons (e–) carriers, such as superoxide (O2•–) and hydrogen peroxide (H2O2). The level of DNA damage that occurs in a healthy cell is partially mitigated by ongoing DNA repair processes. (B) When the nonequilibrium steady state is disrupted, ROS and reactive oxidative by-products produced by oxidative metabolism (the horse) can increase oxidative damage in the genome, which will lead to the gradual deterioration of gene expression (the cart). 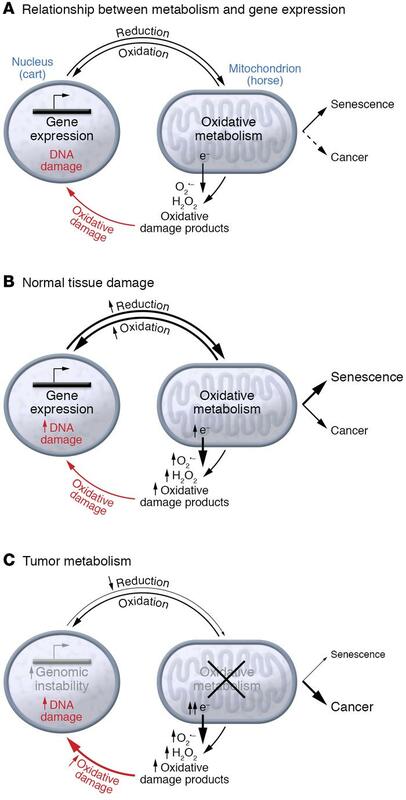 Accumulation of DNA damage leads to cellular senescence or cancer. (C) The deregulated oxidative metabolism in cancer cells produces genomic instability that will eventually drag the cart off the cliff, so to speak, to the valley of death.